Of purchasing a late 1980's to early 1990's SJ413 (leaf spring suspension), doing a complete chassis/drivetrain restoration, and adapting one of these to fit. If someone asked me why, I would have no logical answer. I always wanted to put a fibreglass kit body on my SJ413 cos it had low low mileage but the panels had started to go. I was younger in those days. Your idea sounds superb to me. Helijohn wrote: I was younger in those days. Ain't that just a son-of-a-gun, John. From a comment that Lambert made a while back, I think I'm only a few years behind his parents. It certainly slows things down. Well Daniel and Lambert, I continue to be inspired by this forum. I can't do this alone so think I might just contact my 2 sons. One of them would be the recipient of the finished product anyway. Hopefully it just wouldn't cause a divorce. I'll get them started......as soon as I'm actually done with my current Jimny. zukebob wrote: I'll get them started......as soon as I'm actually done with my current Jimny. My only problem with an SJ these days is that they were never available in auto and I refuse to "do" manual any more. Oh, I meant to mention that there is an SJ or maybe Santana that I see as I drive to Lincoln which is stood on a drive for what seems like forever and is the only one I have seen for years. Last edit: 11 Sep 2018 07:13 by helijohn. I've looked into this before, and found issue with the height of the Suzuki OHV engine compared to the original side valve unit. If you want to keep it low, like a proper Willys, then some sort of bonnet bulge is required. If you don't mind it being a bit jacked up, then I'm sure this can easily be avoided. Shaker hood! DO IT, even more now! I was sure somebody before me thought about the Willys MB body on an a SJ. Never went beyond the dream phase so the engine height issue is interesting. Sorry Lambert. I'm with Busta on the "proper" Willys comment. I don't want it to look like it's supposed to be super charged. 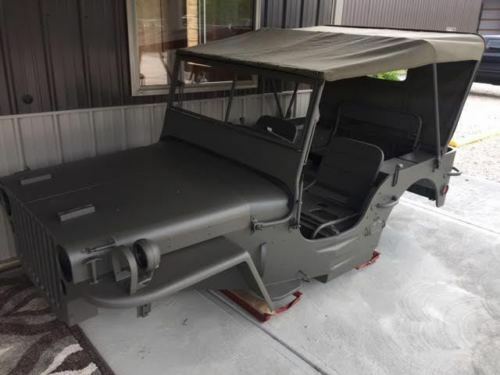 I don't even want it looking like one of the later M606 jeeps. But, as many wise people have said, where there's a will, there's a way.